Studies of the radical environmental politics of the 1960s have tended to downplay the extent to which much of that countercultural intellectual and social ferment continued into the 1970s and 1980s. 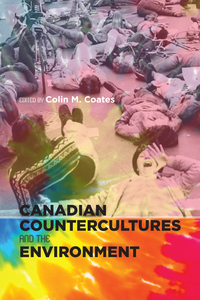 Canadian Countercultures and the Environment adds to our knowledge of this understudied period. This collection contributes a sustained analysis of the beginning of major environmental debates in this era and examines a range of issues related to broad environmental concerns, topics which emerged as key concerns in the context of Cold War military investments and experiments, the oil crisis of the 1970s, debates over gendered roles, and the increasing attention to urban pollution and pesticide use. No other publication dealing with this period covers the wide range of environmental topics (among others, activism, midwifery, organic farming, recycling, urban cycling, and communal living) or geographic locales, from Yukon to Atlantic Canada. Together, they demonstrate how this period influenced and informed environmental action and issues in ways that have had a long-term impact on Canadian society.